The Process was underway before the sun came up in Central Oregon. The Madras farmhouse’s yellow lights cut a slice in the black morning sky at the Symons Beef Company. 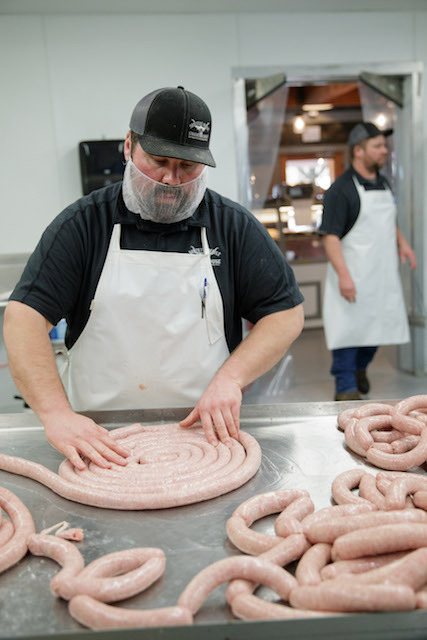 Almost 60 miles to the south in Sisters, Jeff Johnson, co-owner of Sisters Meat and Smokehouse, filed through his email inbox, managing the underbelly of the small-town startup. Both small businesses operate on similar principles—be reliable, show integrity and maintain consistency. One raises the meat, the other serves the meat. 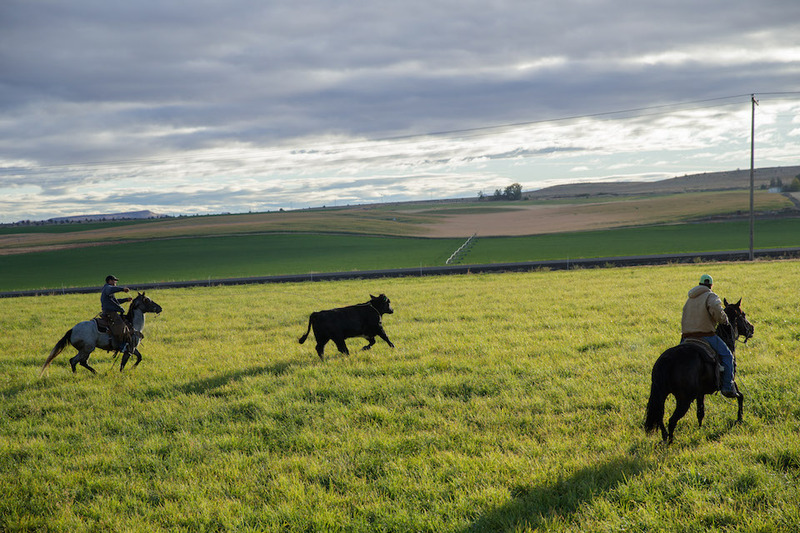 From hoof to home, this story chronicles a cycle of local beef in Oregon. JoHanna Symons, 36, leaned back and looked out her pickup truck’s window. The Symons own the land all the way to the skyline, she said. There are six homes scattered on the property used as employee living quarters. Hay sheds speckle the landscape. 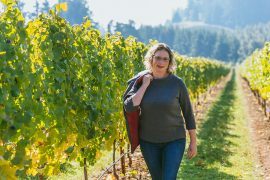 Irrigation pivots, twelve towers long, spray an allotment of water that her husband, Jeremy Symons, 42, ordered at the beginning of the season. In 2014, Jeremy and JoHanna Symons from Madras won Jefferson County’s “Livestockmen of the Year.” This duo has worked for the past ten years growing Symons Beef Company. Their ranching life started from about 10 acres to farming more than 1,000 acres, now running thousands of cattle a year, owning fifty bulls, managing almost ten employees and raising their three kids. Symons Beef Company cattle live and graze on plots at Smith Rock in Terrebonne and Fopiano Ranch in Mitchell, some 70 miles apart. “Ninety percent of our cattle’s lives are on the grass out there in the sagebrush and trees,” JoHanna said. Once calves are about six months, they ween off their mothers and are brought to the Symons’ ranch to “finish them” for slaughter. They come to the ranch weighing 600 to 800 pounds and don’t load the truck for slaughter until they reach 1,300 pounds. Their feed operation works in tandem with an animal nutritionist to ensure the cattle have the appropriate nutrition. “The nutritionist formulates all of the food rations for us at the farm, depending if we need the animal to gain 1 pound or 3 pounds a day,” JoHanna said. The feed lot has a “mixing bowl” so large it fills a dump truck of rations in the cattle pens. Jeremy knows which pen gets what based on the number of cattle and the food they require. 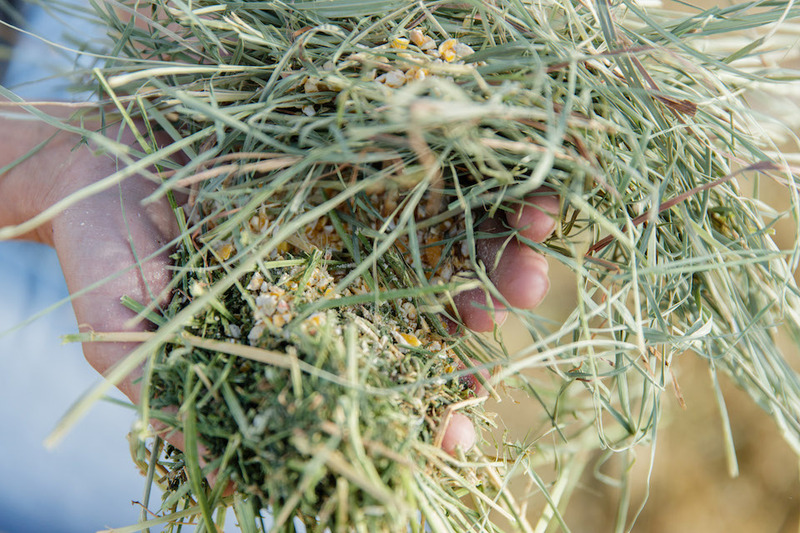 The mixing bowl dumps triticale, corn and alfalfa hay into the appropriate pens. All of the feed comes from the Symons’ farm for a contained ecosystem to grow the cattle. From the ground up, quality remains key to their venture. “We have to cut alfalfa at night because the moisture gets sucked out of the ground and goes into the leaves and keeps the leaves attached to the stems, so it seals in all the proteins,” JoHanna said. The Symons have so many fields, it takes Jeremy twenty-two straight days of work—from 11 p.m. to 4 a.m.—to plow the alfalfa. He does this three times during the summer, consuming two-thirds of the season. He farms at night and cattle ranches during the day. 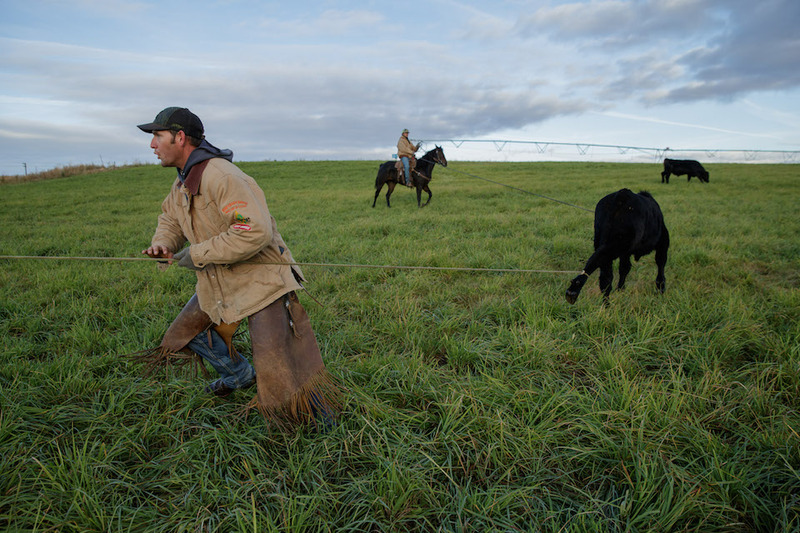 Once the cattle are back near the feed yard, cowboys exercise the cattle every day. “Animals are meant to be free and grazing on a hillside,” JoHanna said. The life cycle and the well-being of the animal require intensive day-to-day observation before being trucked to Kalapooia Valley Grass Fed Processing in Brownsville. Kalapooia is a state-of-the-art facility that follows humane handling guidelines. Symons said Kalapooia is able to sustain its volume for now. Such a facility would make the Symons Beef Company a closed-loop system in the beef life cycle. 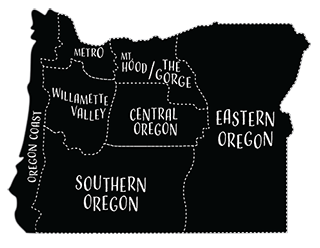 For now, the meat is hauled back from Brownsville to Madras, then delivered to vendors in Central Oregon and Portland. 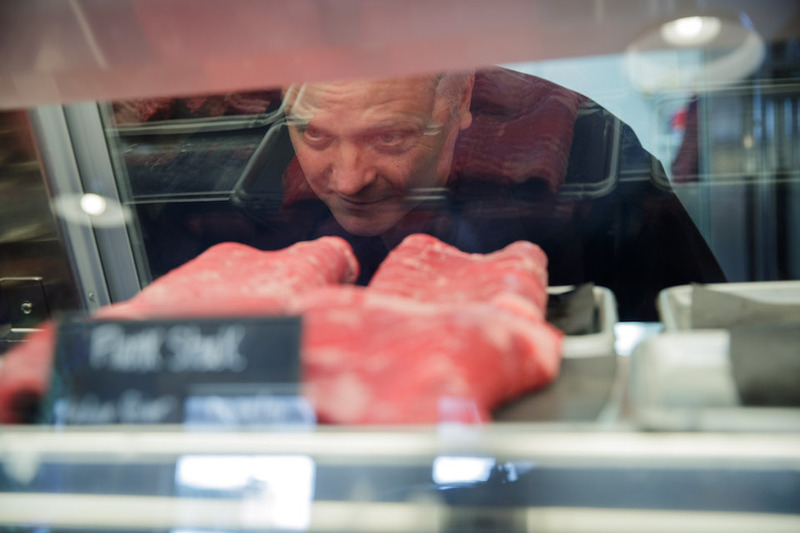 “Excuse me, buddy, could you move that back a little, as we’re going to use the grinder?” Brody Waller of Sisters Meat and Smokehouse asked his meat delivery man. The delivery man put the hand pallet truck in reverse and moved the meat product farther away from the meat locker. 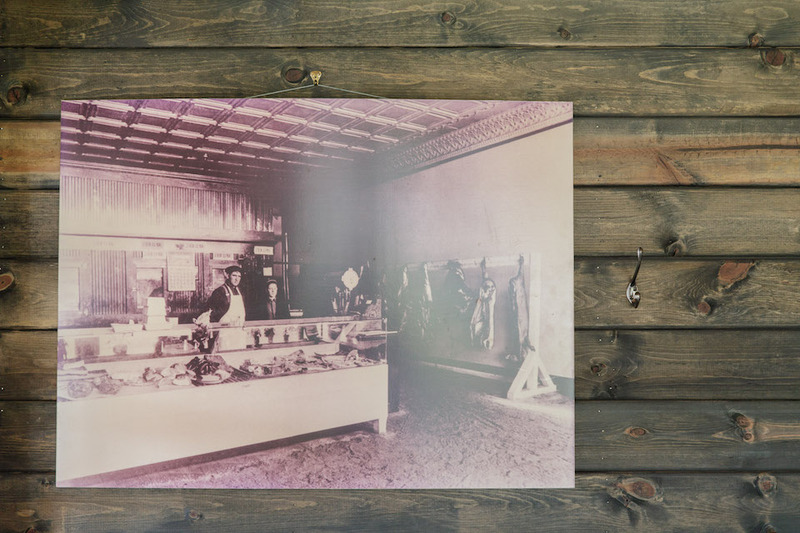 Together the Wallers, third-generation Oregon butchers, manage meat cuts and offerings at the Smokehouse. The Sutherlin-raised men work twelve- to fourteen-hour days, have nineteen fingers among them and perform a butcher’s waltz with each other. “We’re here seven days a week,” Wade Waller said. “It’s a lot of bonding time. We play off each other’s strengths.” Wade, for example, knows how to turn meat and read the meat faster than his younger brother. The older Waller had been cutting meat for eighteen years. He started cutting right out of high school when his father, butcher Steve Waller, asked him to learn the business. Brody, 32, who worked in seasonal construction in Alaska for twelve years, came back to the Willamette Valley each winter where he worked on smokehouse recipes and products, building off his father’s legacy. Their father started the smokehouse program in the mid-1970s, selling into Dee’s Market and Price Less Foods, then retired from the business fifteen years ago. 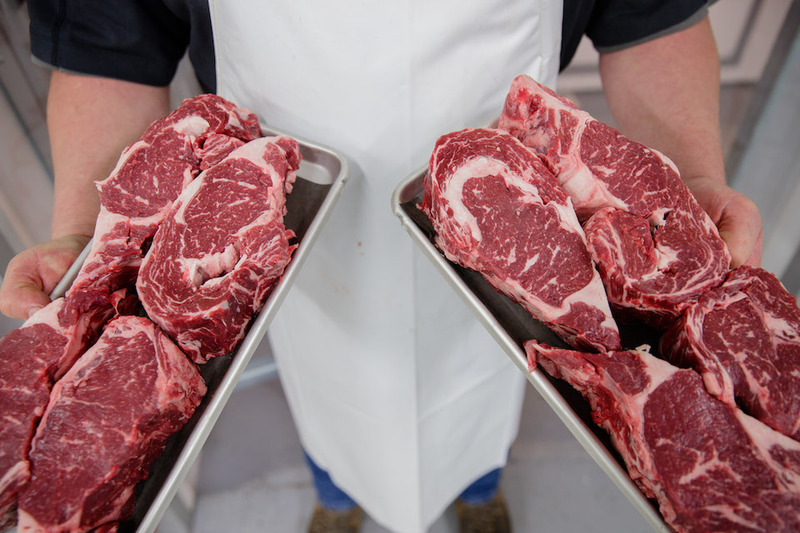 In the United States, primal cuts are the segments of meat taken off the carcass—including rib, round, chuck and loin. 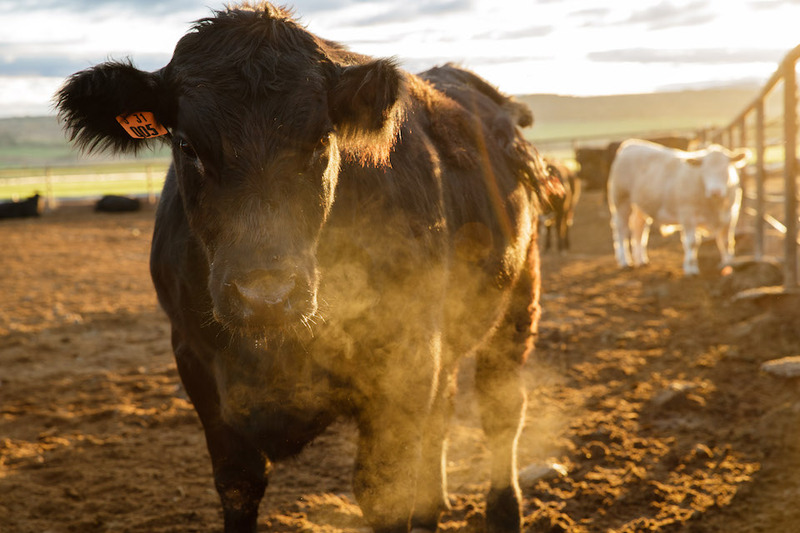 Grass, grain finish and exercise during the cow’s life all contribute to a meat cut’s tenderness and toughness. The more work a cow’s body part endured, the more that cut of meat will be tougher and laced with connective tissue. So, the eye of round from the hind legs is tougher than, say, the abdominal tenderloin or ribeye, because of its muscular use.